on the North Coast of British Columbia. Immersed in the grandeur of British Columbia's rugged coast, Legacy Lodge is where friends meet to share spectacular scenery and battle some of the largest Chinook and Coho Salmon in the world. And at the end of each day, the warmth of true hospitality greets guests returning to the comfort of superior amenities. Known around the world for its magnificent scenery and unparalled salmon fishing, the waters of Rivers Inlet teem with some of the largest Coho and Chinook Salmon in the world. More 50 to 60 pound Chinook Salmon are caught in this fjord-like inlet each year than in any other area in British Columbia. Full of energy and fight, these salmon can battle for hours, over incredible distances. it's about friends sharing the adventure of exploring North America's last wilderness; experiencing humpback and killer whales, dolphins, eagles and a night sky full of stars so bright they'll keep you awake! It's an experience that will stay with you long after you return home, and is sure to call you back again. Wonderfully remote yet easily accessible, Legacy Lodge offers a premier sportfishing experience found nowhere else, in harmony with the natural environment and in a world all its own. Here on the protected waters of Rivers Inlet, you'll be surrounded by the panoramic beauty of British Columbia. This is where all the elements converge for epic sportfishing adventures with the world class salmon that await your challenge. 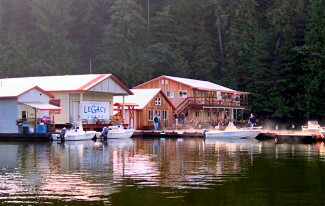 Legacy Lodge provides a true awakening to nature and the ultimate sportfishing experience. Imagine a 20-pound Coho striking your cut plug bait trolled 20 feet from your rod tip, then peeling 200 feet of line off your single action reel in seconds. 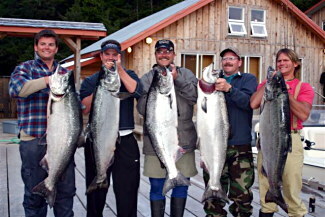 This is Rivers Inlet excitement, and your Legacy Lodge experience at its best! 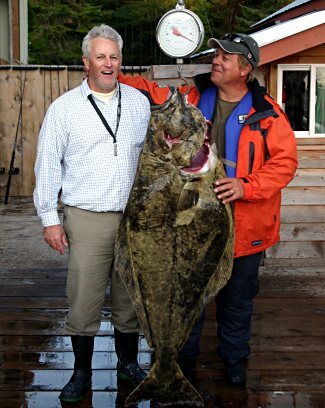 The fertile waters of Rivers Inlet also offer a variety of bottom feeders including Halibut, Yellow Eye and Lingcod which are abundant all season. Legacy Lodge offers seven private guest rooms and six suites, comfortably accommodating up to 20 people. Featuring comfortable linens and luxurious comforters, you'll awake refreshed and ready for the ultimate in sportfishing challenges. Our service and attention to detail is unparalleled, as our friendly and personal staff will see to every detail to enhance your experience. 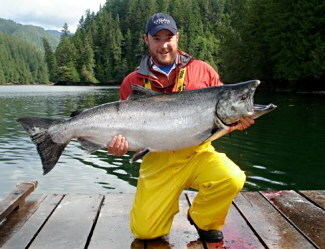 From daily room service, to fish handling, we'll take care of everything at Legacy Lodge at Rivers Inlet. 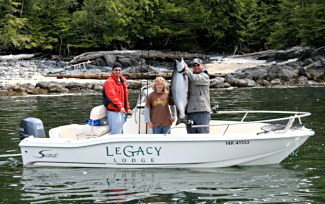 Legacy Lodge at Rivers Inlet invites you to come and share your passion for the great outdoors. There are few places in the world where the experience exceeds all expectations, and the memories last a lifetime. Come experience the ultimate in fishing adventures and renew your passion for the great outdoors. Trips book quickly at Legacy Lodge, so make your reservation now!